We Bought A Zoo Review – Animal House! Worst part: The kooky supporting characters. Director Cameron Crowe (Almost Famous, Jerry Maguire) has once again created an in- depth account of the troubles surrounding the average Joe. 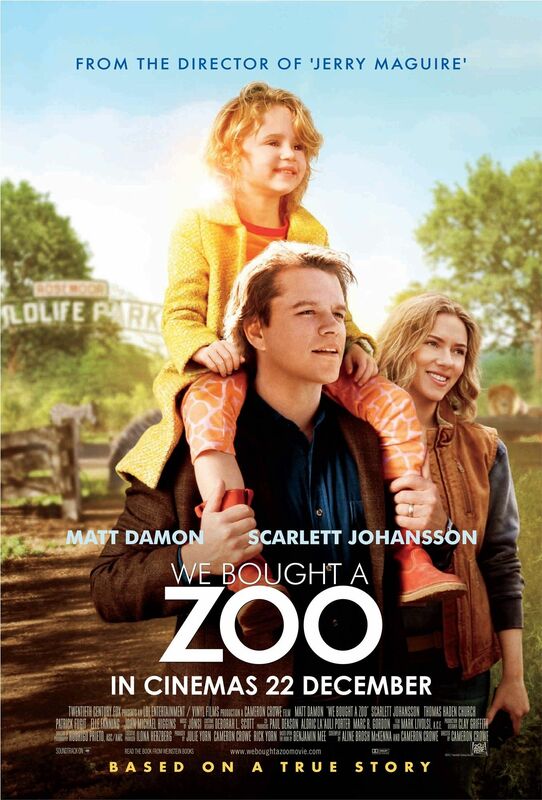 We Bought a Zoo is a touching and sweet retelling of the book of the same name; based on the story of Benjamin Mee, a family man who found a fresh start by buying and maintaining a Zoological Park. 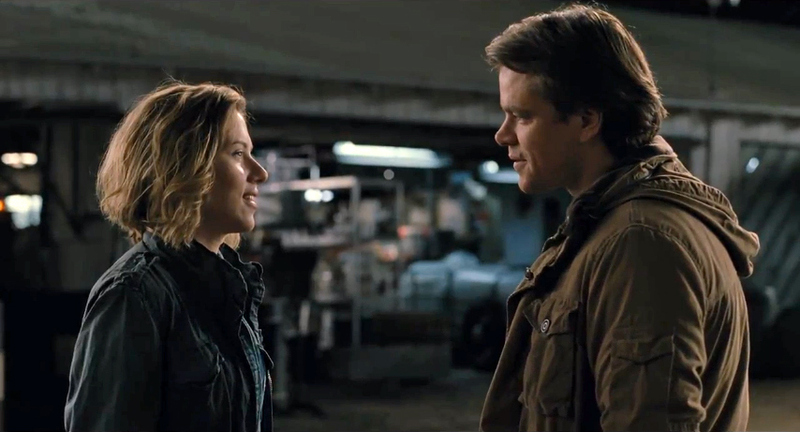 Matt Damon & Scarlett Johansson. Matt Damon, delivering his natural likeability as a widower on the verge of leaving everything behind, plays Mee in the film. After buying the house connected to the zoo, a sale aided by an enthusiastic realtor (J. B. Smoove), he goes about making the best of a bizarre situation. He soon meets the gaggle of volunteer zookeepers, led by Kelly (Scarlett Johansson), and things start looking up. Over the course of a few months, our lead, his family, and his new friends go on a insatiably invigorating journey through think and thin with creatures great and small. Mee, his two children and the collection of unique personalities making up the volunteers must then band together to re-open the park in time for the summer. Along the way, they must defend the park from the clutches of notorious zoo/national park inspector Walter Ferris (John Michael Higgins). Elle Fanning & Colin Ford. “You know, sometimes all you need is twenty seconds of insane courage. Just literally twenty seconds of just embarrassing bravery. And I promise you, something great will come of it.” (Benjamin Mee (Matt Damon), We Bought a Zoo). Much like Almost famous, the chemistry between the child and teen actors is We Bought a Zoo‘s most charming element. Mee’s kids Dylan and Rosie (Colin Ford and Maggie Elizabeth Jones) fit perfectly into the story due to their differing emotional adventures. Elizabeth Jones’ character Rosie not only gets some of the funniest dialogue but also delivers some of the cutest reaction shots seen in quite some time. Meanwhile, tows the line perfectly between sullen and enthusiastic. Grasping a pitch-perfect version of childhood, his is a wholly recognisable and empathetic character. 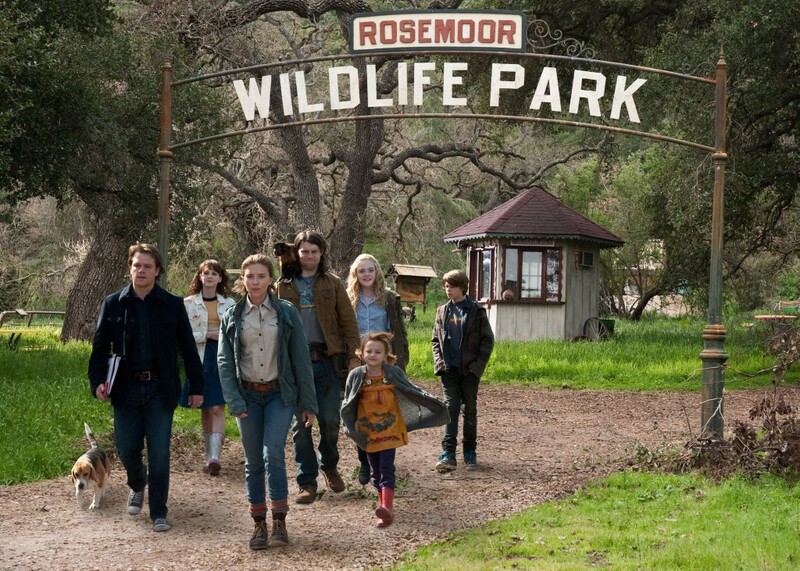 Elle Fanning (Super 8) is also a stand out as Lily, a peppy young 13-year-old working at the zoo. Her growing sense of excitement when confronted with a boy her age is a delight to watch as their cute relationship plays out. Crowe manages to provide a glimpse into his sense of style particularly familiar to fans of Almost Famous. The pseudo-hippy personalities of some of the supporting characters along with the frequent rock guitar score and artistically edited flashback sequences lend a fun and retro sense of style to this extraordinary and heartfelt story. Throughout We Bought a Zoo, the “awws” and “oohs” echoed across the crowd like a cutesy Mexican Wave. Thanks to the starry cast and charming direction on offer, this dramedy is the perfect for distraction for life’s many obstacles. It makes an animal out of us all! Verdict: A sweet and charming family film.